BUNNICULA. (DVD Artwork). ©Warner Bros.
Bunnicula, the vampire rabbit from the best-selling children’s book series comes to life in “Bunnicula,” a brand-new animated comedy series from Warner Bros. Animation, currently airing on Cartoon Network and releasing on DVD Tuesday June 27, by Warner Bros. Home Entertainment. Titled “Bunnicula: Night of the Vegetable, Season 1 Part 1,” the release will retail for $18.94. The animated horror-comedy series also is available on Digital HD via purchase from participating digital retailers, including Amazon Video, CinemaNow, iTunes, PlayStation, Vudu, Xbox and others. 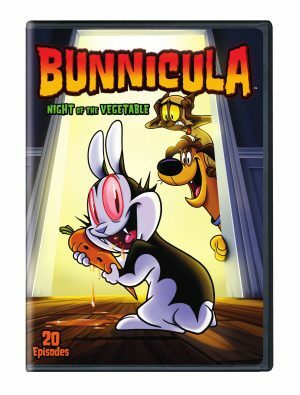 “Bunnicula” follows the paranormal comedy adventures of a vampire rabbit that has an insatiable appetite for fresh vegetable juice, which boosts his paranormal powers. Upon moving to the mysterious Orlock apartment building in New Orleans, 13-year-old Mina discovers Bunnicula locked away in a chamber way down in the basement. Mina falls instantly in love with Bunnicula, and adopts him as a pet, not knowing he has supernatural abilities. The mischievous rabbit is met with open arms by Mina’s lovable, laid-back dog, Harold, and abject fear by Mina’s paranoid cat, Chester. However, Bunnicula loves Mina and will do anything to protect her from all the crazy supernatural animals and monsters he attracts, including ghostly alligators who squeeze through the pipes of their apartment building and sinister spider-lambs released from Bunnicula’s book of supernatural bedtime stories. No carrot is safe around this supernatural bunny, whose escapades with Mina, Harold and Chester take viewers on a set of entertaining, supernatural adventures. Returning with all-new episodes of the British mystery series, “Midsomer Murders, Series 19, Part 1” makes its DVD ad Blu-ray debut on Tuesday June 27, from Acorn, an RLJ Entertainment. brand. The capable Detective Chief Inspector John Barnaby (Neil Dudgeon, “Life of Riley”) investigates the cozy villages of Midsomer’s most sinister secrets. This two-disc set features four feature-length episodes, plus bonus ($34.99, AcornOnline.com). The English village mystery gets a contemporary spin in this hit British television series that has earned a worldwide following. Bucolic settings harbor macabre crimes and eccentric characters that are no match for DCI John Barnaby (Dudgeon) and his new assistant, DS Jamie Winter (Nick Hendrix, “The Crown”). Guest stars include Neil Morrissey (“Line of Duty”), Susan Hampshire (“Monarch of the Glen”), Anthony Calf, Sally Phillips, Caroline Blakiston, Natasha Little, Michael Obiora, Susan Jameson, and the return of former series regular Jason Hughes. The four mysteries are “The Village That Rose from the Dead,” in which Barnaby and his new sergeant investigate the death of a man after a party celebrating the reopening of an abandoned village; “Crime and Punishment,” in which the bludgeoning death of Bleakridge’s butcher points to a series of robberies the victim had been investigating; “Last Man Out” where, after a star cricket player is murdered, Barnaby and Nelson’s begin an investigation that leads them to a surprising suspect—Barnaby’s former sergeant Ben Jones and “Red in Tooth & Claw,” set in the annual Bellville Hall Small Pet Show, a local real estate agent is found stabbed to death amid a herd of rabbits. Both the DVD and Blu-ray are available in a two-disc set containing four episodes plus bonus behind-the-scenes featurettes. 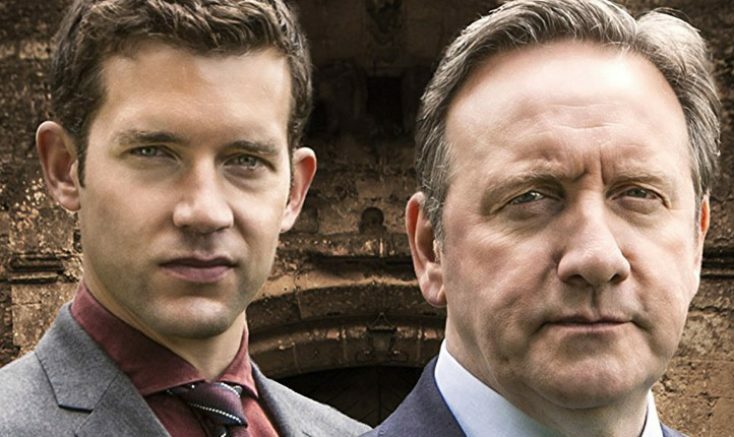 “Midsomer Murders, Series 19, Part 1” made its U.S. premiere in March on Acorn TV, the premier North American streaming service for TV from Britain and beyond. Also from Acorn, is the original TV series and new Irish legal drama “Striking Out,” makes its DVD debut Tuesday June 27, from Acorn. Amy Huberman (“The Clinic”), Neil Morrissey (“Line of Duty”), and Rory Keenan (“War & Peace”) star in this four-part drama that follows the trials and tribulations of a young solicitor as she faces turmoil in her personal and professional life. When Dublin-based solicitor Tara Rafferty (Huberman) discovers that her fiance and fellow solicitor, Eric (Keenan), has been cheating on her with a colleague, she breaks up with him, quits her job at the prestigious law firm where they worked together, and begins accepting clients out of a makeshift office in the back of a cafe. With the help of Ray (Emmet Byrne, “Red Rock”), her street-smart client-turned-assistant, private detective Meg Riley (Fiona O’Shaughnessy, “Utopia”), and friend and mentor Senior Counsel Vincent Pike (Morrissey), Tara takes on a series of cases that often pit her against her former colleagues and the influential families of the legal establishment she is trying to leave behind. Huberman won the Irish Film and TV Academy award this year for Best Actress in a Lead Role/Drama and the series was nominated for Best Drama Series. The two-disc DVD set features four episodes, plus bonus interviews with the cast and crew and a behind-the-scenes photo gallery ($39.99, AcornOnline.com). Striking Out made its U.S. premiere on Acorn TV in March. XLrator Media has six new titles available on DVD and On Demand Tuesday June 27. “The Similars,” a sci-fi horror film set in an out-of-the-way bus station on a supernaturally stormy night, is helmed by Mexican director Isaac Ezban. “Admiral” is a 17th century epic chronicling the rise of Dutch naval hero Michiel de Ruyter as he saves the Netherlands from English, French and German rule. It stars Rutger Hauer and Charles Dance. “Kill Ratio” an action adventure thriller set in Eastern Europe and stars Tom Hopper. “Sun Choke” is a critically acclaimed drama from director Ben Cresciman about a patient recovering from a severe psychotic break while she is under the care of two women with agendas of their own. “Crossing Point” tells the story of a young American couple vacationing in Baja who unwittingly become involved with a cocaine smuggling cartel and have only twelve hours to survive. “Paradox” follows the tale of a group of M.I.T. students who create a time machine that gives them a limited amount of time to go back and stop a murder that has already happened. 4K ‘Interstellar,’ ‘Victoria & Abdul,’ ‘Dunkirk,’ More on Home Entertainment … plus a giveaway!! !